Generally accepted as the most ingeniously evil device ever concocted by Baron Silas Greenback. transported to the North Pole by a fleet of Camels clad in thermal underwear, it was assembled under supervision of Nero (the only one with 'O' level maths). 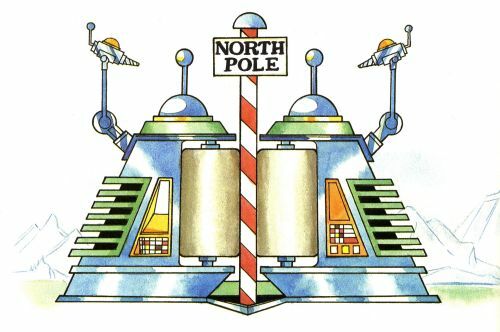 The aim was to apply a contra-rotating force to the North Pole if the world powers failed to accede to the Baron's demands. The result of this awesome event would have been to catapult every building, animal, vegetable, human or inhuman being into space - and the nearer the Equator, the faster. The two high-friction rollers are kept in contact with the pole by spring-loaded pinions working on off-set trunnions located with countersunk bunions and lubricated by onions. The clue to what is perhaps the most ingenious aspect of the device is what many have believed to be cooling fins projecting like the teeth of vast combs on either side of the drive casing. Any serious student of 'Dangermouse', civil engineering or Javanese flower arranging will know that this could not be! They are, in fact, the entrance tunnels for the propulsion units - the 528,000 gerbils who power the rollers by running on them. Cynics have queried this gerbil-power and have asked why they should choose to run around in circles. At 38°C below freezing how would you keep warm?! Return to the Monstrous Machines Page. Return to the Danger Mouse Page.